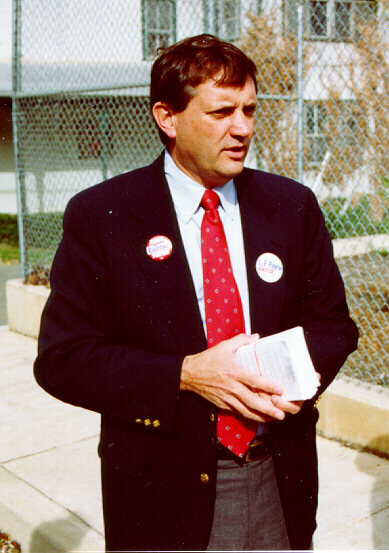 On September 16th, when Fifth District Congressman L.F. Payne entered the race for nomination for Virginia lieutenant governor, he had the "support of 18 of 20 Democratic state senators, 45 of the 52 Democrats in the House of Delegates and 94 of 135 local party chairmen" (The Washington Post, September 17, 1996). "A native of rural Amherst County with a schoolteacher mother and state trooper father, Payne, 50, said the two top principles that will guide him would be that 'no part of Virginia will be left behind' and that he would work to bring people together to solve problems" (Daily Progress, September 17, 1966). On November 20, 1996, Raven Yates of the L.F. Payne campaign team began moving into Payne's new digs for the statewide race. Payne "is renting the former Snooky's Loan and Own at 114 E. Main Street, next to the Jefferson Theater ... (Yates says) Payne plans an official headquarters opening sometime in January" (Daily Progress, November 20, 1996). The new headquarters is equiped with one new phone number, 293-LF97, but he doesn't have an answering phone yet. Congressman-elect Virgil H. Goode, Jr., who will take Payne's seat in Congress, "said he plans to maintain a congressional district office in Charlottesville (just) as Payne has done" (Daily Progress, November 20, 1996). On December 5th, UVa Rector Hovey S. Dabney hosted a fundraiser for L.F. Payne at Boar's Head Inn. 110 Charlottesville donors attended and nearly $100,000 was raised in the process (Daily Progress, December 8, 1996).